I love the construction of the magic carpet in this set, since one of my first thoughts when seeing both the Ninjago tassel piece in 2016 and the Joker Manor funhouse mirror panel in 2017 was "this would be great on a new version of Aladdin's magic carpet!" 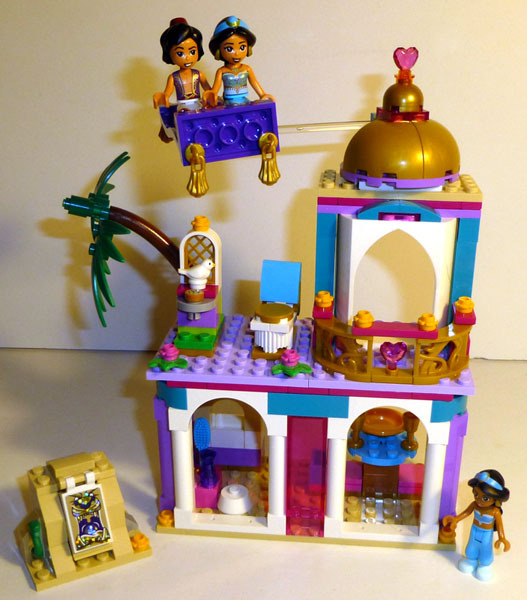 I agree that the LEGO Disney Princess sets are often pretty basic and underwhelming as far as building is concerned. It's kind of understandable with this year's in particular, since regardless of size/price, they all have a 5+ age range (aside from the 4+/Juniors ones). In other themes like Friends and City, it's more typical for the target age to scale a little more according to the size of the sets, so medium-sized sets might have a 6+ target age and bigger sets might have a 7+, 8+, or even 9+ target age. Perhaps LEGO feels like older kids will be more drawn to the new or recent Disney IPs, rather than the classic princess movies and toys associated with them. After all, I feel like a lot of sets from other Disney subthemes like Frozen, Moana, and Tangled: The Series have done a better job in terms of both accuracy to the source material and impressiveness of the finished build than the ones with Disney Princess or Whisker Haven branding. I think the redesign of the Jasmine mini-doll and the new Aladdin mini-doll look quite good! Both use the Nougat skin tone that first appeared as a mini-doll skin tone on the redesigned Olivia from LEGO Friends, whereas the old Jasmine mini-doll used Medium Nougat. This seems to compare favorably with many of the movie's more brightly lit scenes. This also means that Medium Nougat can be used as the skin tone for the new Tiana mini-doll in 41162. Compared to many animals in the Disney sets, the bird in this one is rather generic, and a part of me preferred how the previous set featuring Jasmine used a LEGO Friends tiger cub as Rajah… even if he was way smaller than he ought to be! That at least was an animal that felt more distinctive. But I do approve of this new songbird element, which because of its small size and minimal printed detail will be equally suited to minifigure and mini-doll themes… much like other animals often shared between those themes like the spider, or baby bunny. The "collect and swap" feature of this set is a carry-over from last year's Disney Princess sets. I'm not too enthused by it myself, as it doesn't seem to mesh as naturally with the source material as the modular designs of the early 2000s Harry Potter sets, or offer as much versatility as the Creator 3-in-1 modular houses. But it does help seed the sets with some cool building elements.